WASP-12 star is a yellow dwarf star, in the constellation Auriga, 870 light-years from Earth. The star has a planet orbiting it every 1.1 days. If the Earth orbits the Sun at a distance of 150 million kilometers, this planet orbits its star at a distance of 3.4 million km. 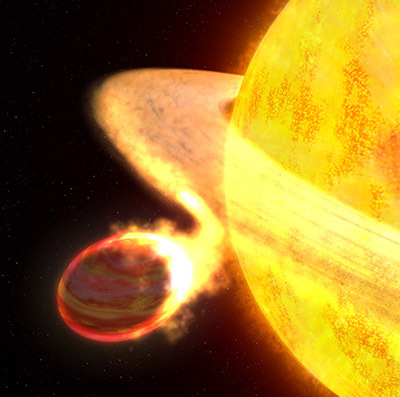 To make matters worse, the WASP-12 star is larger and hotter than our Sun. In the May 10, 2010 issue of the Astrophysical Journal Letters, it was claimed that the gas cloud above the planet extends up to 60,000 km above the surface. The mass of the planet is estimated to be 1.4 times the mass of Jupiter. The gravitational pull of the star stretched the planet into a shape of a rugby ball. Due to the enourmous heat, the planet's atmosphere is three times the size of Jupiter; but it is gradually lost, as matter is spilled into the star. Every seven years, the planet loses as much matter as is contained in all of Earth's oceans. In this flow of matter, chemical elements never observed on planets outside of our Solar System were discovered. This is the first time matter exchange has been observed between a star and a planet. But the end of the planet is nowhere near. According to some estimates, it would take 10 million years for the star to pull this planet into itself. This discovery has verified two former hypotheses of astronomers. One is that if the planet was too close to the star, it would be stretched by the gravitational pull from the star. The other one is that because of the resulting heat of being so close to the star, the planet's atmosphere would expand. By the way, WASP stands for Wide Area Search for Planets, a British project. The image you see is not a real photograph, because the star is too far away from us for Hubble telescope to take a picture of it. Instead, this is an artist's impression of the data obtained through studies.